The snow is deep in Maine's Busman's Harbor and the mighty rivers are covered in ice. 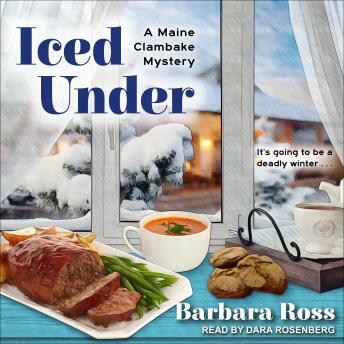 Snowden Family Clambake Company proprietor Julia Snowden and her mother, Jacqueline, are hunkered down for the winter when a mysterious package arrives-heating up February with an unexpected case of murder. Inside the mystery package is an enormous black diamond necklace that once belonged to Julia's great-grandmother and disappeared in the 1920s. Who could have sent it-and why? Julia's search for clues takes her on a perilous journey through her mother's troubled family history, from a squabble over the family fortune in 'frozen water' to the recent unexplained death of Jacqueline's long-lost cousin Hugh-who'd been missing and presumed drowned for more than forty years. To protect her mother's inheritance, Julia must fend off a small army of feuding relatives, solve the mystery surrounding Hugh's demise, and get back home before the next blizzard buries them all . . .